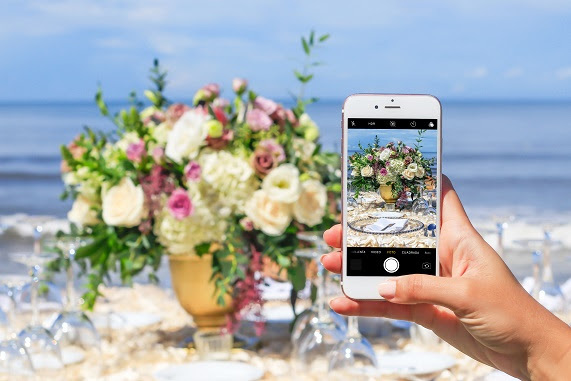 Puerto Vallarta, Mexico (November 15, 2018) – For an Insta-Worthy wedding, the AAA Five Diamond Grand Velas Riviera Nayarit and adults-only Casa Velas in Puerto Vallarta now have a wedding consultant onsite to provide tips to get the most out of the wedding ‘gram. Some of the suggestions include jazzing up the walk down the aisle with sweet signs, greenery walls and paper pinwheels to add some color and excitement to the photos. Fresh flora, such as air plants and succulents, neon signs, calligraphy and a photo booth, with a fun backdrop and a few blush-inducing props, are also suggested. The Instagram consultant will recommend tips during inspection and planning trips. The service is included in all weddings at Grand Velas Riviera Nayarit and Casa Velas. Application of idea is additional. Offering unmatched experiences for destination weddings, Mexico’s Velas Resorts also offer couples the opportunity to have a unique first dance choreographed by a renowned dancer from the hit shows Dancing with The Stars and So You Think You Can Dance. Drone filming, live wedding paintings, a margarita cake menu, live streaming of the ceremony and a personal social media concierge to capture and post the special moments a couple says I do are also available upgrades. Inclusive of complete wedding planning services from New York’s Brilliant Event Planning, there is a Billionaire’s Wedding Package which starts at $2.5 million for an over-the-top multi-day affair. For more information on Velas Resorts Weddings or to book, please call 1-866-868-0922, email weddings@velasresorts.com, or visit www.velasweddings.com.